That morning, I walked from my little hut in Rieul to the tea house, and on my way I passed the new place that Dakini had built. I saw Maxine sitting there, but given that we hadn’t yet officially announced our upcoming move, it seemed better to go back to the tea house. Maxine Walden: yes, very very nice! We crossed by foot the eighty or so meters that separated us from the tea house. There we were greeted by Fael, Stargate and Adams. We talked about our new meeting place. Stargate Tone: new place ? Fael Illyar: It’d also be possible to make scripted objects that sort of combine the two spaces. Adams Rubble: could it be turned off and on for meetigns, Fael? Stargate Tone: Hm …well…is there anyway any privacy in SL ??? Fael Illyar: It’s easy to make it so it can be turned off. Pema Pera: to switch it on and off? We looked at various ways to connect the different meeting places, directly or indirectly. Adams Rubble: I have a different idea…. Stargate Tone: well; to me it’s all the same…as I’ve wished myself so often, that people would’ve stay in IM…. Adams Rubble: Could there be some kind of box or something that would tell a meeting is in session at the other place? Pema Pera: it is so much simpler to just have one place! Stargate Tone: U know about the lags of too many AV’s in the sim ? Adams Rubble: Is there a forest here now? Fael Illyar: *, it depends on the AVs a lot too. Fael addressed Star’s lag concerns. Fael Illyar: Star, usually most of that lag is caused by a small number of the AVs in there. Stargate Tone: would U tell how that is ? Fael Illyar: I suspect a tool for finding out who is heavily scripted will come too. Stargate Tone: well…and this heavily scripted can be what ? Stargate Tone: thinking that might I be such AV…. Fael Illyar: Well, it can be almost anything. Even if the scripts do practically nothing. Fael Illyar: I tend to familiarize myself with new things fast. Fael Illyar: for me it tends to be that I either dive or then I don’t even touch the surface. At this point Sky dropped by and we all spoke in unision. Pema Pera: well, shall we go to the new place? Pema Pera: to my right? Pema Pera: do you see which one I mean? One by one we disappeared from the room, and finally found each other again in the new place. I was the last one to jump over, and thus dropped into the middle of the conversation there. Fael Illyar: Although, I wasn’t concentrating on my body. I started with breath but quickly widened it to … well, everything I hope. Pema Pera: could you summarize what you discussed, before Sky and I arrived? Fael Illyar: Somehow felt a lot less noisy with less people around… although, it felt like it wasn’t sound. Fael Illyar: Moon, there should be a key combination to switch those. Sky Szimmer: are we meeting here from now on? The English language has never been the same since Moon arrived on the scene. Moon Fargis: what do you want for signs? wooden? That is all Moon needed to hear . . .
Pema Pera: with steam coming out yes? Pema Pera: to do something really outrageous!!! Sky Szimmer: I love it! Rapidly a sign appeared, first quite lovely looking, wooden, in Japanese style. Pema Pera wonders what he will find at the tea house when he wakes up tomorrow . . .
Pema Pera: .. and how many emails from Dakini . . . . Moon Fargis: ok heres the sign.. too large? Pema Pera: but not “Moon” enough — where is the neon?? Fael Illyar: moon? full bright for the sign part? Pema Pera: how about the steam, Moon? Jeffro walked by, and Sky had to leave. Pema Pera: saw our neon sign from afar? After the initial blaze that left the sign unreadable, Moon somehow managed to temper the middle part so that most of the words were just barely readible in the middle of the glow . . . .
Jeffro Andel: anyone know where i can get a job? Pema Pera: what kind of job? Pema Pera: you were born today? Pema Pera: and came to SL to find a job? Fael Illyar: Pema, that depends on where you’re from. In some places 100L/hour is a lot. Jeffro Andel: lol can someone show me where clubs r? Pema Pera: but in those places you pay more than 100L/hour for internet connection . . . .
Jeffro Andel: wait anyone know where a guitar shop is? That seemed like the most accurate thing Moon had said in quite a while. Pema Pera: we will get many fans of burning man . . . .
Pema Pera: and also one inside? Pema Pera: but not everybody seems to find it easy to use them. Pema Pera: Good night Adams, *, Fael, Moon! Pema Pera: Shall I send an email announcing that this is the new place? Pema Pera: okay, will do! Pema Pera: Good thing I won’t see my email in the next six hours or so . . . . .
And in such a way it turned out that we had said goodbye to the tea house, and had moved into the new place, quite a bit earlier than I had expected. I exited from SL, and read my email. Storm and I then quickly exchanged some messages, about the text that should appear on Moon’s signs. 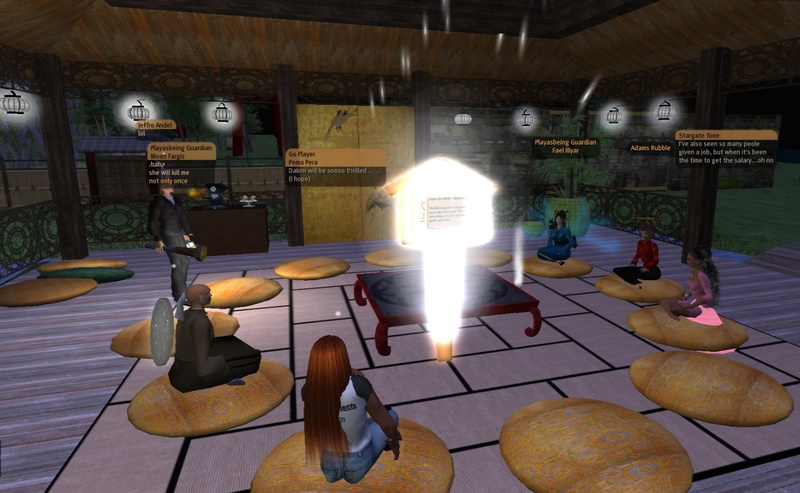 I decided then to get back into SL briefly to discuss what we thought with the others there who were still in-world. Just before I could announce what I had suggested and Storm had agreed upon, Adams was already ahead of me. Pema Pera: did you just guess that?!?!?!?! Pema Pera: Moon: pavilion on the sign please! Pema Pera: enjoy your day, everybody!